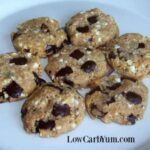 An easy recipe for low carb keto flourless peanut butter chocolate chip cookies. Use any nut or seed butter in the recipe if you don’t like peanuts. 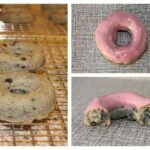 After making my own sugar free chocolate chips, I needed to see how they performed when baked in a cookie. 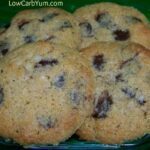 Since I’ve already posted my favorite low carb chocolate chip cookie recipe, I had to find a new recipe to try the chips in. 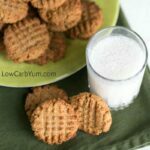 I found a recipe for flourless peanut butter cookies at Food.com that use only peanut butter as the base. It’s a popular recipe that you can find all over the web. 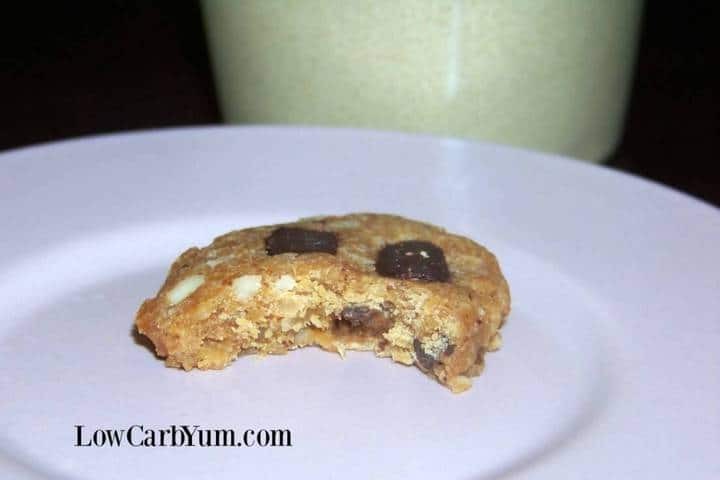 I upped the flavor in my keto flourless peanut butter chocolate chip cookies by adding both chocolate pieces and peanuts. If you have an allergy to peanuts, you can simply replace the peanut butter with sunflower butter and leave out the nuts. 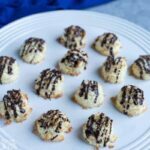 There is no coconut flour, almond flour or flour of any kind in these keto cookies. It’s one of those recipes that uses everyday common ingredients. 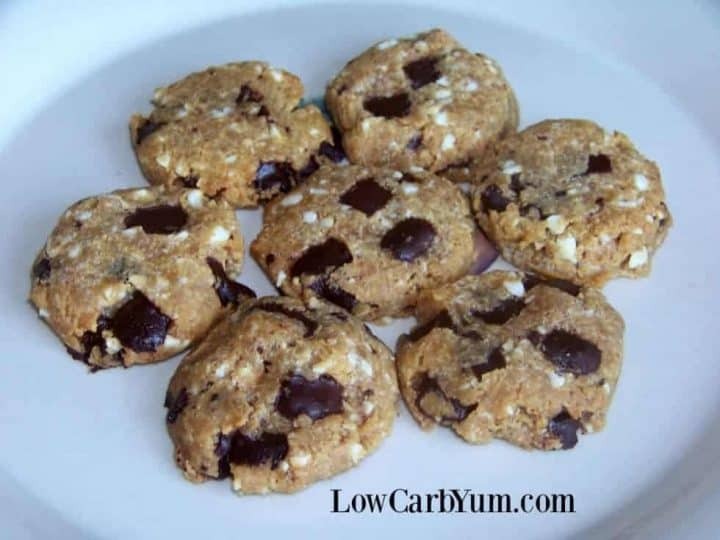 Most low carbers keep erythritol, stevia and low carb chocolate chips in the pantry. 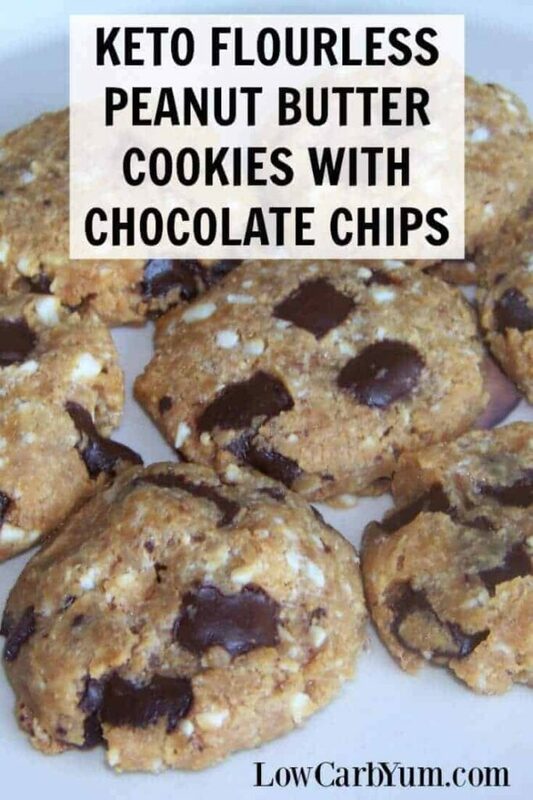 So these flourless peanut butter chocolate chip cookies can be made just about anytime you want a simple snack. I had some blanched peanuts so I used those in the cookie batter. 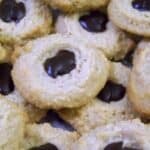 But, any chopped nuts will do in this cookie recipe. You can certainly leave the nuts out, especially if you are using a chunky peanut putter. For me, the nuts add a bit of substance. I know that most people who follow the Banting low carb diet refrain from eating peanuts even if there isn’t a sensitivity. Peanuts are a legume and not a nut which is why the Banting diet recommends not eating them. However, they are a low carb legume and are very similar in taste, texture, and nutritional content to nuts. So, I eat them sparingly on my low carb diet. If you aren’t sure about peanuts, give this article a read and decide for yourself. I’ve had a food sensitivity test done and peanuts did not come up as something I need to avoid. So, I choose to include them in my diet. 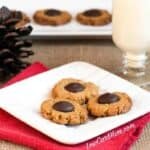 An easy recipe for gluten free flourless chocolate chip cookies using unsweetened peanut butter. Any nut butter can be used in place of flour in the recipe. In a medium bowl, mix peanut butter, erythritol, stevia, salt, and eggs until well combined. Drop by rounded tablespoonfuls or cookie dough scoop onto ungreased cookie sheet. Bake 10 to 12 minutes or till lightly browned. Cool on cookie sheet for a few minutes then transfer to wire rack to cool completely. I prefer using my own homemade stevia sweetened chocolate chips. Late comer here 🙂 I am glad to find your recipe. I have a question and would love your input. 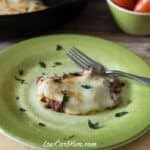 I doubled this recipe using 3 cu. peanut butter and 4 eggs. The cookies turned out more dense than I like them, and I wondered if it was because I doubled the eggs. Any insight? oops TWO cups peanut butter, four eggs. I think it was too much peanut butter. Doubling should have only used 2 cups not 3. 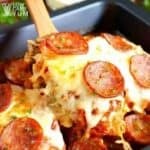 This recipe is one I must try! 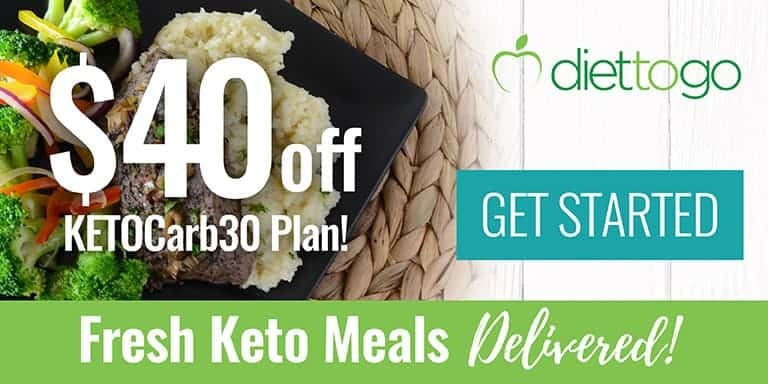 Keto is new to me and so is erythritol. Where do I purchase it, please? Most natural food stores carry it. I find it in the natural food section of my grocery store. 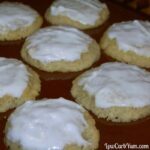 Yummy <3 I love keto cookies like this! What can be substituted for the stevia concentrated powder? I have stevia packets and stevia drops…would either of those work? And would there be a difference in measurement? You’d need about double the amount to use stevia drops. The equivalent packet amount is around 6 packets. What is the difference between Swerve and concentrated Stevia powder? 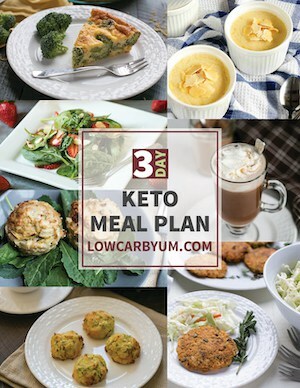 New to this whole low carb Keto thing so I am still figuring stuff out. Swerve is a 1-for-1 sugar replacement so 1 cup Swerve is equal to about 1 cup sugar. Whereas 1 teaspoon concentrated stevia powder equals about the sweetness of 1 cup sugar. Obviously, taste is a little different too but I find blending multiple sweeteners provides the best taste. I don’t see why it wouldn’t work. You may just need to adjust if the batter is too thin. I buy Lily’s brand off Amazon or Thrive Market online. Hershey makes some. Got mine at Wal-Mart. In this recipe, either granular or powdered can be used. Powdered is a little more compressed so you should be able to get away with using less. However, I usually just add the same amount, regardless if it is granular or powdered. The best way to measure is by weight and I am working on putting together a chart for converting various low carb ingredients from standard US measurements to ounce/gram weight. I am starting to use my kitchen scale to make sure the amounts are more accurate. 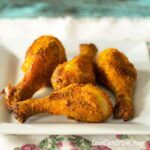 The powdered erythritol worked perfectly as you said – I used a little bit less to be on the safe side and they were sweetened just enough for us. And I didn’t need to add any extra nuts since we used Adams Natural Crunchy peanut butter to begin with – there were plenty of nice sized nuts in each cookie. Thanks again for your recipes! Glad you liked them and thanks for the tip on using crunchy versus smooth peanut butter.